« Buy an anniversary t-shirt! Many of us hate to think about winter weather but inevitably it will be here soon enough. As per Ordinance 6.09. The owner, occupant or person in charge of a building or structure or unoccupied lot in the Village fronting or abutting any street shall clean the sidewalk in front of or adjoining each such building or unoccupied lot, of snow or ice to the width of such sidewalk by 10:00a.m. of each day and shall cause the same to be kept clear from ice and snow. When the ice has formed on any sidewalk so that it cannot be immediately removed, such persons shall keep the same sprinkled with ashes, salt (or similar substance), sawdust or sand. In case snow shall continue to fall during and after 10:00 a.m., then it shall be removed 3 hours of daylight after it shall cease to fall. PENALTY. Any owner, occupant or person in charge of a building or structure or unoccupied lot in the Village fronting or abutting any street who fails to remove snow and/or ice as required by subsection (a), above, shall be liable to the Village for the cost of removal of the same, which costs shall be at the rate of One Hundred Fifty ($150.00) Dollars for the first hour or any fraction thereof, and One Hundred ($100.00) Dollars per hour thereafter. Such costs shall be payable within ten (10) days of billing and may be imposed as a lien against the real property as a special assessment until paid. 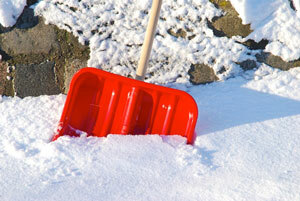 As a courtesy to the water meter reader please clear away the snow from your gas meter so the water meter can be read. Copyright © 2010 Village of Paddock Lake, Wisconsin. All Rights Reserved.